Preheat the oven to 350 degrees F. Lightly grease an 8x8 inch baking dish and set aside. In a large bowl, whisk together the melted butter, granulated sugar and brown sugar until well combined. Whisk in the vanilla, and then the eggs, one at a time and stir until smooth. In another bowl, stir together the flour, cocoa powder, baking powder and salt until combined. Add the flour mixture into the wet ingredients and stir until just combined. Soften the REESE chocolate peanut butter spread in the microwave, about 30-60 seconds on high power. Stir 1/2 cup of the REESE spread into the brownie batter. Pour the batter into the prepared baking dish and smooth it out. 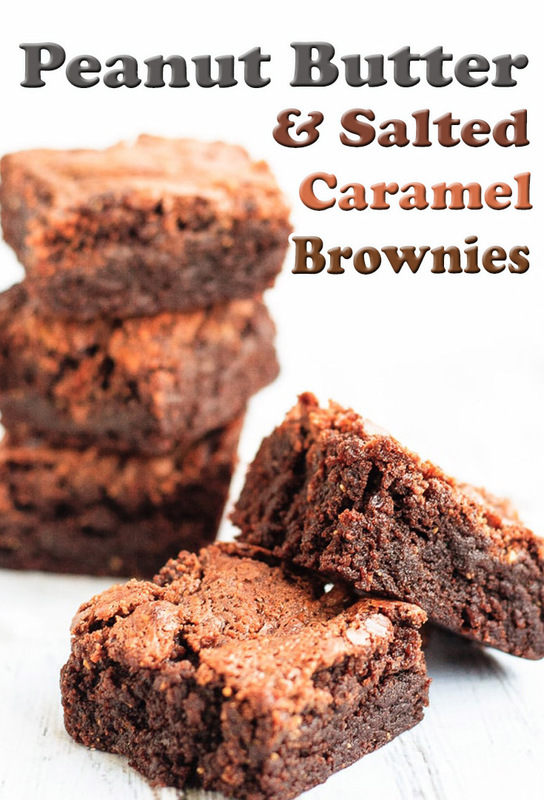 Drizzle the salted caramel and the remaining 1/4 cup of softened REESE spread all over the top of the brownie batter. Use the tip of a knife to swirl the caramel and REESE peanut butter together. Bake for 35-40 minutes until the brownies are just set in the middle. Remove from the oven and allow to cool completely before cutting and removing them from the pan. Brownies will keep well for up to 5 days in an airtight container at room temperature, or can be frozen for up to 3 months.